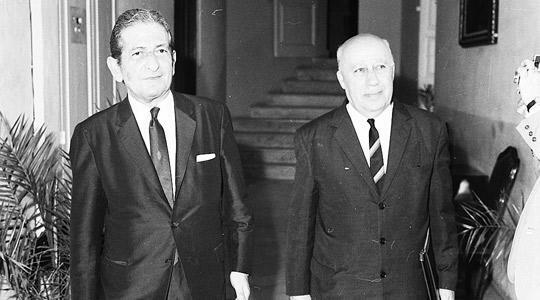 Giovanni Felice (right), former Minister of Finance with the then Nationalist Prime Minister George Borg Olivier. Photo courtesy of DOI. I have now been residing in Canada for nearly 30 years, during which time I visited my beloved island many times. I am sure many will agree that great progress has been made all around and this is confirmed by people like me who are not there every day to witness the changes. There are so many statues, gardens, roads, buildings, sports facilities named after people who in one way or another contributed towards this progress in a small and not a small way. I find it ironic that the memory of Giovanni Felice (1899-1977), MP for Sliema from 1953 to 1971, Minister for Tourism and later Minister for Finance is not much evidenced. These two ministerial positions were firsts at that time and were to lay the foundations for tourism in Malta on a large scale as well as the setting up of the Central Bank of Malta coming to mind. Perhaps most of his voters are now dead, and time has eroded the memory of this person who worked ceaselessly for Malta, even when his wife was very sick, who never asked, begged or crossed the line of legality for votes and in my opinion was incorruptible. I used to walk with him on the promenade in front of the Carmelite Priory at Balluta, Sliema where a number of palm trees were at one time planted by him (at that time the first ever in Malta for such trees). He used to say that they will long outlive him and I will be able to enjoy them years after he was gone. In the 1940s he used to take us, his family, to swim at the small pebbly beach below and other times rent a boat from the fisherman who owned the small hut in front of the church by the water's edge. I am sure this was one of his favourite places - why not name it after him - Giovanni Felice Promenade. After all, giving his lifetime to the country and party deserves this little memento of gratitude. I am sure that the few that are still alive today who bore the flag of Malta and the party in good and bad times will be more than happy. In his own quiet way he left behind many other achievements of a higher intellectual nature not for his benefit but for the benefit of those who came after him. I know I am his son. Perhaps the Sliema council would support my humble suggestion this time around.